In the late 1800s, panoramic illustrations, known as bird’s-eye views, became a popular means of portraying towns throughout Connecticut as the industrial age transformed them from agrarian hamlets into booming economic centers. Bird’s-eye view lithographs, such as the one seen here, earned their name because the city or town depicted was rendered as though seen from a high vantage point. Although these prints often idealized the built environment’s virtues and downplayed its flaws, they nonetheless provide historians with useful information. 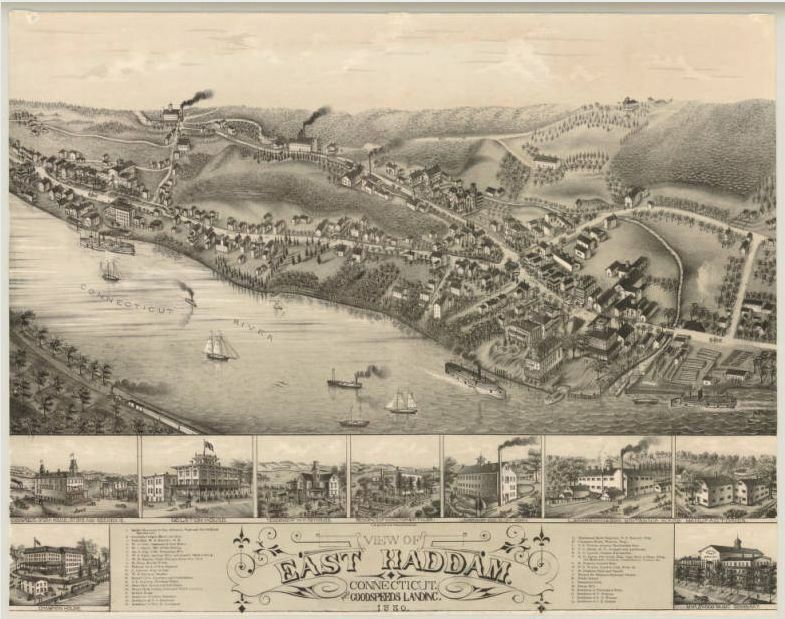 In 1880, East Haddam was already a popular tourist destination. Although a small town, its migrant tourist population caused two steamboat landings to be built, each near an attraction and a hotel, and competing with one another for summer visitors. 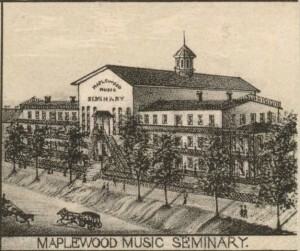 Goodspeed’s Opera House (#2, lower right and vignette) and Gelston House (#17, lower right and vignette) stood next to the lower ferry landing, while those wishing to see operas at the Maplewood Music Seminary (A, upper left and vignette) could lodge at the Champion House (B, left and vignette) and arrive at the Upper Landing. Both the Gelston House and Goodspeed’s Opera House were owned by East Haddam entrepreneur, William H. Goodspeed who also owned the local ferry, a shipbuilding company, and interest in the Hartford & New York Steamboat Company. His imposing residence is to the left of the Opera House. One major industry in the town, which is emphasized in the view by a billowy plume of black smoke penetrating the skyline, was the L. Boardman & Son Britannia Ware Manufactory and Silver Works (upper left, upper center, and vignettes). Two prominent and impressive Boardman residences on Boardman Avenue (#18 and #19, right center) stand as witnesses to the prosperity of the company. The elaborate curving title of the print with its decorative floral borders reflects the festive air that must have prevailed in this resort town. Kate Steinway, Executive Director of the Connecticut Historical Society (CHS) in Hartford, curated the traveling exhibition, Hamlets & Hubs; Bird’s-Eye Views of Connecticut Towns, 1849-1908 (1987-88), from which this article is derived, while Curator of Prints and Photographs at CHS. “Collection of Bird’s-Eye View Maps.” Connecticut History Illustrated, 2016. Link. “Collection of Bird’s-Eye View Maps.” University of Connecticut Libraries’, Map and Geographic Information Center (MAGIC), 2016. Link. Boat Shoes Have Ties to Connecticut – Who Knew?